Fishing Report: My First Bass!!! Crazy Day Running Around Palmetto! 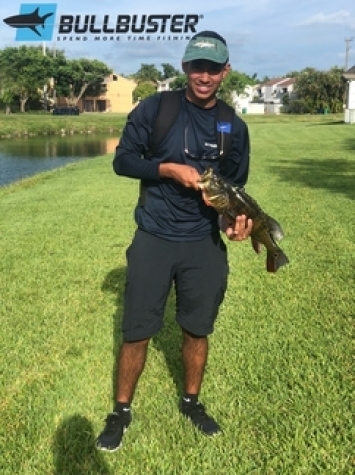 So I wanted to go fishing in freshwater because I’ve never caught a bass before, so I asked one of our Ambassadors Albert Acosta who was mainly focusing on fishing for bass for the last couple months. He gave me 2 spots but I only went too one due to the time we had because of traffic. Off that spot we caught 2 fishes one was my peacock bass, and one was an Oscar which my sister caught. I released the huge bass because I really didn’t want to take that huge monster home same thing with the Oscar. After those 2 hits it was dead for like 1 hour so we moved to a different location that my brother in law knew there was fish in. So when we got there I looked around the canal and I saw there was fish just sitting there. So I rushed to the car and unpacked the supply’s and started casting... at this point we have smaller shiners because we used all the bigger ones at the last canal we were at. So long story short, I ended up catching only one fish out of 3. The one I caught was a huge tilapia, I hooked on a huge peacock but the hook came out his mouth, and a small largemouth but when I got him on shore the lure came out his mouth sadly. Would’ve been my first large mouth. But next time hopefully we will have more time to fish more than we did that day and explore new canals and catch some more fish. Thanks for reading my article, and We Want You To Spend More Time Fishing!